BlogHome » Cleaning Smoke Damage: DIY or Call a Professional? When a fire breaks out in your home or business, the flames cause harsh damage that is obvious to spot. The severely high temperatures that come with a fire threaten your safety, and its flames burn objects and building materials. With enough time, the flames spread throughout the space and can cause so much damage that it jeopardizes the structural integrity of your residential or commercial property. Knowing this, it makes sense to feel relief once the fire has been extinguished. However, a fire’s flames are just one part of the damage fires cause to your property. The amount of damage smoke can cause is often overlooked. Even after the fire is out, smoke will continue to harm your property. Smoke causes both visible and invisible damage as it continues to linger throughout your home or business. The longer smoke lingers, the more potential harm it can cause to your home, but also to you, your family, and any inhabitants. In terms of the visible damage smoke causes, ceilings, walls, and other surfaces can become charred, discolored, and/or stained. Within a few days, these surfaces can turn yellow. In addition to being discolored, other surfaces, such as those made of wood or plastic, can become warped. Materials like glass will become etched as a result of the smoke, and this etching can ruin the material’s chemical composition. No matter whether the smoke damage is visible or not or how severe the damage is, the best action to take in the aftermath of a fire is to hire a professional for smoke damage restoration. Sometimes, do-it-yourself cleaning techniques are insufficient, because the damage is too severe. In some cases, like when an object has gone through a chemical reaction, you can’t simply clean it. But even if the damage isn’t serious, trying to clean smoke damage yourself can make things worse if you don’t go about the process properly. With professional help, you can be assured that the cleaning done to combat smoke damage and odors will be conducted properly and effectively. Plastic and fiberglass: Plastic and fiberglass will experience a chemical reaction from the heat of the fire that will cause them to turn yellow. Scrubbing will not prevent or remove the discoloration. Walls: Walls can become permanently damaged without immediate professional restoration. Metal: Metal surfaces and objects are at risk of tarnishing and even corrosion if they are not properly restored. Carpeting: Your carpet can hold in odors from the smoke. It takes professional deodorization to remove these odors. Glass: Heat, ash and smoke can ruin the chemical composition of glass surfaces. Wood: Wood surfaces exposed to the fire and smoke must be sanded and refinished to restore their appearance. Professional technicians who perform smoke damage restoration have the necessary equipment to clean the effects of smoke damage. Additionally, professionals have and use specialized cleaning products that are unavailable to the general public. These cleaning products are more advanced and effective than standard products, making them a better choice in such a scenario. The longer smoke and soot damage go unaddressed, the higher the chance there is for the damage to become permanent. If you conduct the cleanup yourself, you will need to take the time to gather the materials and learn how to do go about the cleaning process the right way. In contrast, professionals are experts at smoke damage restoration. They know exactly what to do to when going about the cleanup process, so they will be efficient with their work. At ServiceMaster Restoration and Cleaning, we provide smoke and fire damage restoration services to help clean and restore residential and commercial properties in the aftermath of a fire. Our expert technicians will thoroughly clean the effects of smoke and soot damage and properly restore the structural damage to your home or business in a safe, efficient manner so you can return to your property as soon as possible. In cases of small fire and/or smoke damage, to clean ceilings and walls yourself, use a dry-cleaning sponge. Unlike a standard sponge, a dry-cleaning sponge is specially made to remove stains and soot from smoke and residue. Afterwards, soak the affected areas with vinegar, rubbing alcohol, or paint thinner. Then use a solution of trisodium phosphate cleaner and hot water to wipe down the walls. Wipe down other surfaces, like countertops and appliances, too. You can also use a vacuum with an upholstery attachment to gently pick up loose soot particles. When cleaning smoke damage yourself, you should always take the proper safety precautions. Wear goggles and rubber gloves and clothe yourself properly for your protection. Aside from the visible damage, smoke after a fire can also cause further damage to your home and belongings with its odor. Carpeting, upholstery, clothing, and other fabric materials will absorb the smoke odor. This not only has the potential to ruin the affected items, but also allow the smell to remain on the property well after the fire and smoke are gone. The smoke particles become deeply embedded into the materials, and this makes it rather difficult to remove the smell. 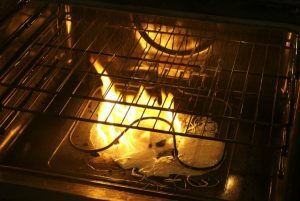 An ordinary air freshener or fragrance isn’t powerful enough to combat the strong stench of smoke after a fire, but there are other do-it-yourself techniques you can use to eliminate the odor. Baking soda will naturally absorb odors. If you sprinkle some baking soda onto the materials that have absorbed the odor, it will help eliminate the smell. Activated charcoal is another product that naturally absorbs odors and it works similarly to baking soda. 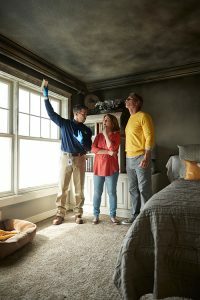 Key Takeaway: If you do not have the right experience and access to special cleaning products that aren’t readily available to homeowners, hiring a professional who knows how to clean fire and smoke damage is the better choice to make. 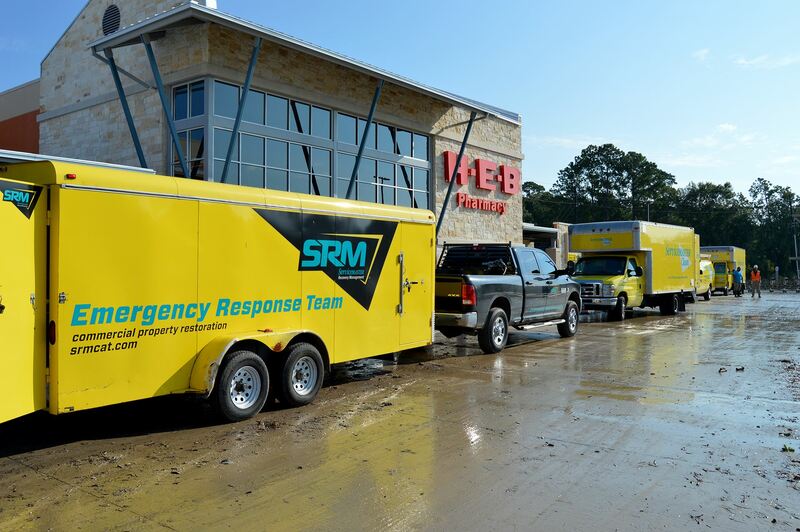 After Harvey's flood waters receded, ServiceMaster Restoration & Cleaning's commercial division was on location at the Kingwood H-E-B. A restoration plan was put in place and the cleanup process began.